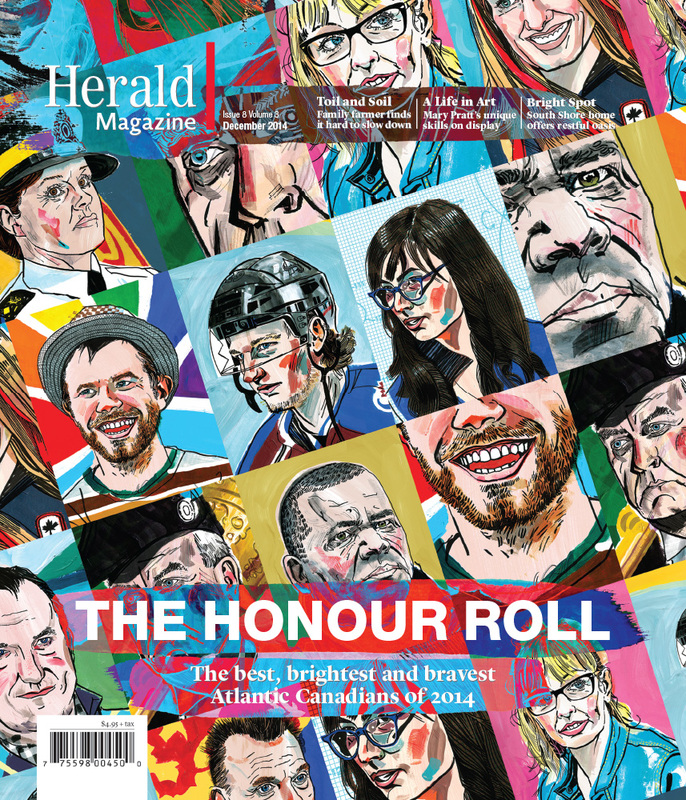 The result of an intense (16 day) project to produce ten portraits, and the cover art for The Herald Magazine, here in Nova Scotia. One of the offshoots of illustration is learning; it was such an inspiration to find out more about these people, how they think, and what they had achieved. The magazine is out today (December 6th) — can’t wait to get my hands on a copy. This entry was tagged Atlantic Canada, studio work. Bookmark the permalink. wow! they look really fantastic. Thanks Tigrowna, I was pleased how it turned out. Best, Russell. Congratulations, Russell! The cover looks fantastic. Thanks Nancy. Yes, surprising really considering it was three in the morning when I was putting this together :-D Best, Russell. Sometimes 3 in the morning is when the brilliance happens! Yes, must be the late night/caffine-induced delirium :-D Take care, Russell. Brilliant Russell! Great to see your stuff out there. Can’t think of a better person for a piece like this. Thanks Josh—good to hear from you. Hope your week is going well so far. Best, Russell. Thank you very much Etta, Russell. Congratulations Russell and great work! Thanks Mr Hayashi :-) I hope all is well in the wilderness, Russell.